Weird Wonderful Web: Fancy some Pooh on toast? 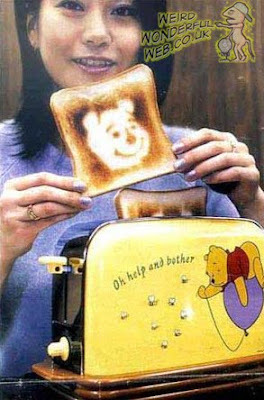 Fancy some Pooh on toast? But what about pooh on your toast? Have you ever tried that? Hey don't knock it 'til ya tried it! Of course I am referring to Pooh as in Winnie the Pooh, as you can so obviously see on the right. Because actual poo would be so wrong, but Winnie the Pooh is sooo right! (well someone must think so to make this).